We are one of Europe’s leading companies in intralogistics. We plan and realise customised integrated systems from a single supplier. Intelligent storage solutions which increase your productivity, optimise your storage space and improve your working practices. Swisslog designs, develops and delivers best-in-class automation solutions for forward-thinking health systems, warehouses and distribution centers. Dematic designs, integrates and maintains turnkey automated material handling solutions that increase efficiency and reduce costs of intralogistics processes in warehouses, production and distribution centers. Hörmann Logistik is specialized in sophisticated warehouse, conveyor systems and customized intra logistics system solutions. We are one of the leading providers of high performance conveyors for material handling, from incoming goods to production. Langhammer GmbH is a leading provider of transportation and palletizing systems. Experts for industry automation and informatics. Leading supplier of tailored turnkey systems for warehouse and distribution centers. We belong to the leading manufacturers of racking systems and installations for the storage of pallets and industrial goods. At UniCarriers 5000+ individuals worldwide are united by a desire to develop, manufacture and distribute industrial trucks that create difference. AGV's and Mobile Industrial Robots to automate your logistics and internal transportation of heavy loads and pallets easily and cost-effectively. Since it was founded in 1921, SCHULTE Lagertechnik has been under constant development. Today, we are a leading manufacturer of industrial shelving systems and produce items such as shelving, pallet racking and steel mezzanines. An international company and a leading provider of integrated logistic systems for in-house logistics. For over 30 years, DS AUTOMOTION GmbH has been specializing in the development and production of Automated Guided Vehicle Systems (AGVs) and has become one of the world's leading suppliers in this segment. Our portfolio ranges from requirements analysis and professional consulting to the development of customized logistics concepts which guarantee high flexibility and transparency while at the same time, minimizing process costs. The Servus Shuttle System provides you everything for your intralogistics needs from a single source - tailor-made! AGVR is a leading provider of AGV and control devices. Innovative guidance and navigation solutions for intelligent, autonomous transport vehicles. Verbruggen offers the best solutions for palletizing boxes, bags or crates by automatic stacking methods. We have more than 25 years of experience developing the most efficient, long lasting palletizers with unprecedented stacking capacities. viastore systems is a leading manufacturer of AS/RS, Conveyor Systems and WMS Software Solutions. Noblelift is a Chinese leading manufacturer and service provider for material handling equipment and logistics solutions. 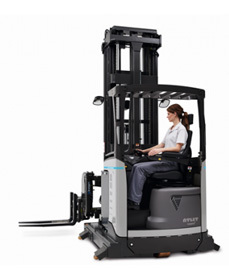 VanRiet has been improving the material handling systems of its customers. In the area of automated transport, sorting solutions or both. Our lifting equipment, vacuum lifters, mobile lifters, crane systems, hoists and grippers enables everyone to lift large and heavy goods, ensuring flexibility and efficiency in your business. A global leader providing a comprehensive range of intelligent intralogistics and materials handling solutions. EuroSort, manufacturer of industry-leading sorting technology . We work with systems integrators and consultants. Our sorting systems are deployed to end users to significantly improve product throughput ! With our innovative sensor technology, we make industrial trucks and forklift trucks fit for effective and safe use / material flow. The additional intelligence prevents accidents and operational disruptions and increases driving comfort. We upgrade your forklift trucks as well. Kivnon researches, designs, develops, manufactures and sells driverless transport vehicles and related complementary systems with the aim of improving its customers' internal logistics. With our unique overhead conveyors and extensive knowledge of lean and production, we help companies all around the world with clean and green conveyor solutions. KDL develops, plans and implements KDL software systems in the field of transport and warehouse logistics. NEDCON ia a global leader in storage systems and offers a large range of products for manual and automated storage systems like pallet racks, drive-in racks, pallet shuttles, automatic pallet storage, shelving systems, open face miniload and mezzanine floors. The Spanish Manufacturers´ Association of Construction, Public Works and Mining Equipment offers a wide overview over Spanish material handling manufacturers. ADC, the first French manufacturer of lifting and handling equipment offers hoists, travelling cranes, jib-cranes, gantry and semi-gantry, rails and travelling beams and lifting platforms. KAUP Attachments, Side Shifters, Fork Positioners, Multi Pallet Handlers, and Container Spreaders for a variety of applications. Our gantry robots are ideal for precise picking and placement of heavy payloads up to 800kg or part loading and unloading. Our design includes sophisticated interpolating motion systems that enables almost limitless options for any combination of high speeds, long strokes, heavy payloads, and high positioning accuracy.